In 2009 I was introduced to the concept of having a dedicated landing page for each PPC ad. I saw first hand how conversion rates soar when this simple process is put into place and knew I would be an advocate for rest the rest of my professional life. At the time conversion rate optimization was still in its infancy. The first ever Conversion Conference was held in 2010 and I was there (on behalf of my employer at the time). Just three years later, here we are, living in a world where almost all of the major companies like Dell, General Mills and DHL understand the necessity of using dedicated landing pages. This understanding is trickling down into small businesses as well, where smart marketers are using software, like Unbounce, to create and test dedicated landing pages. Unfortunately, it seems that many organizations think this necessity begins and ends with Google AdWords. There seems to be a notion that Facebook ads are somehow different and dedicated landing pages aren’t necessary. When it comes to creating dedicated landing pages we know there are a couple of best practices that set the standard for lifting conversion rates, whether it’s a PPC campaign or a Facebook advertisement. Message match means simply ensuring that ad copy is clearly reflected on the landing page. This usually means the ad headline and landing page headline match up. Additionally the offer from the ad and the one being made on the landing page must match up. Message match creates relevancy for your visitor and lets them know they are the right place. Image match is an extension of message match. When it comes to Facebook ads, banner ads or any other medium that allows images, the landing page should contain the same image used in the ad. Just like with headline and offer matches, image match tells the user that he’s in the right place. I recently clicked through four Facebook ads that piqued my interest and was disappointed by the pages I landed on. They aren’t terrible, but there is always room for improvement. In the first three examples, the landing pages are actually custom tabs that keep the visitor within Facebook. In the fourth example, the brand takes the visitor to a landing page outside of Facebook. I really like the design of this landing page a lot – it’s focused and has a big call-to-action. 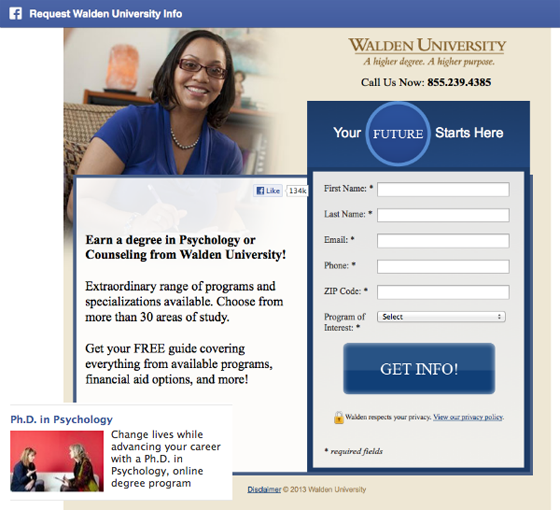 I also love how the custom tab on Walden’s Facebook page is designed to look exactly like a regular landing page. Kudos to Walden for that! If you look at the ad you see the headline reads, “Ph.D. in Psychology” but the landing page makes no mention about a Ph.D. program. Instead it references “a degree” which could be anything – a bachelor’s degree, a master’s degree or even an associate’s degree! As anyone who has ever researched Ph.D. programs knows, your questions and interests vary widely from someone who is looking at a bachelor program. You aren’t so much interested in financial aid options as you are in research concentrations and noteworthy professors you might get to work with. I would highly suggest to Walden that they create custom landing pages for each degree level to better cater to the needs of students at those levels. Additionally the ad mentions an “online degree program” but nowhere on the landing page do I see the word “online degree” or “online classes.” If the mention of an online program is what got me to click, that is a feature I need to see highlighted right away. Finally, there is certainly no image match between the ad and the landing page. The goal of this Facebook ad and corresponding landing page is to generate more “likes” for the page. 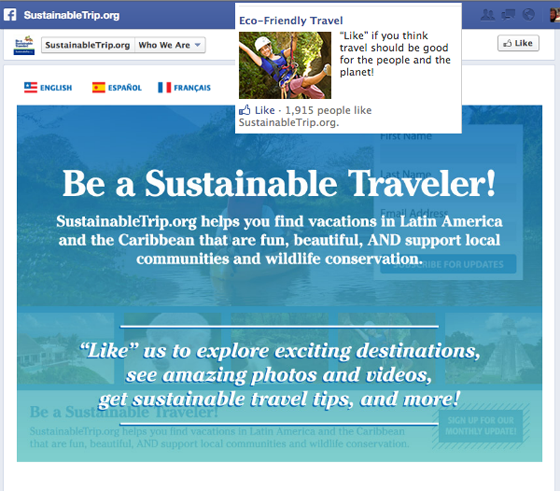 When I click the ad headline I am taken to a page that says, “Be a Sustainable Traveler!” The ad had mentioned being “eco-friendly” but the landing page headline says “sustainable.” Yes, these two words can be interchangeable, but why not create cohesion by using the same word in both? You could interject and say it’s possible SustainableTrip.org is a/b testing their ads by creating one version that says “Eco-Friendly Travel” and one that says “Sustainable Travel” and if this is the case I would argue that they should have two separate landing pages – each with headlines that match the ad. Without doing so they are not getting true results. Additionally, the call-to-action “Like us to explore exciting destinations…” doesn’t really stand out from the rest of the landing page. I would probably add a directional cue (such as an arrow) that points towards the “like” button up top and also experiment with making the CTA a different color so that it stands out better. I love this ad for a lot of reasons: really compelling headline, great visual, and clear call to action in the body copy. I just wish the landing page was a little more tailored to the ad. I love that the there is image match between the ad and landing page – 10 points for that! I also really like their use a directional cue that guides the eye to the “like” button at the top. 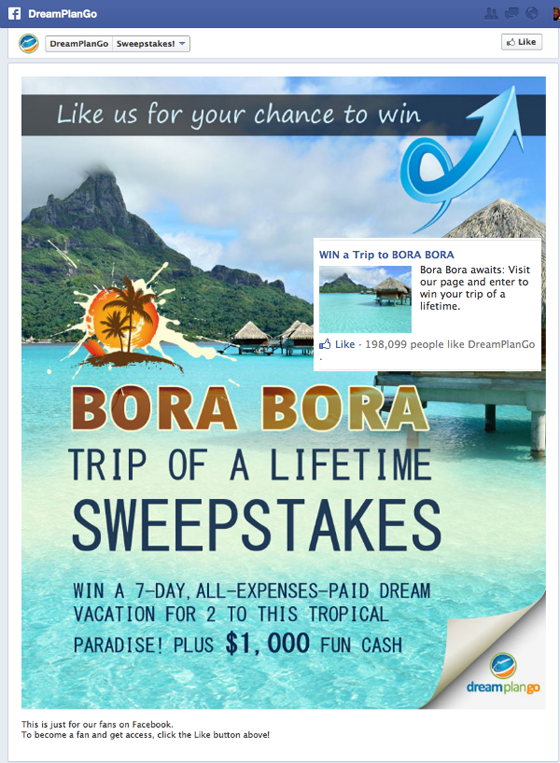 The ad headline reads, “WIN a Trip to BORA BORA” while the landing page says, “BORA BORA TRIP OF A LIFETIME SWEEPSTAKES.” A simple change here so that the ad and landing page headlines are the same could improve conversions. Additionally, if this is a lead generation campaign for DreamPlanGo, I would remove the “like” barrier to entry. If the goal is to get as many people to fill out the entry form behind the fan gate, so remove the fan gate altogether. 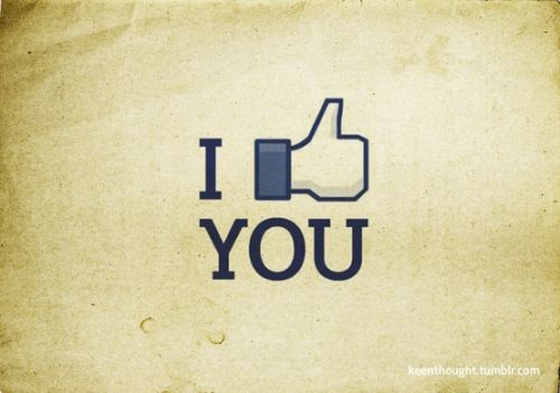 You can always earn that Facebook “like” later on down the road. However, if the goal of this campaign is simply to generate more “likes” than the fan gate makes sense. At first glance this landing page isn’t bad at all. I see important facts being pointed out in a bulleted list, the call-to-action is above the fold and stands out, I see social proof and there’s no leaky navigation. 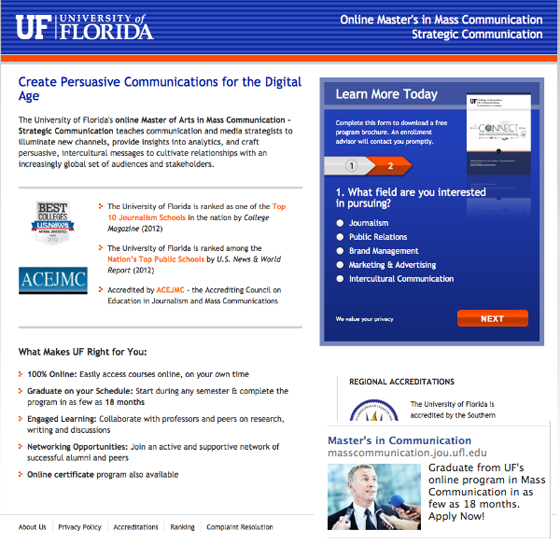 First of all, the ad headline reads, “Master’s in Communication” but the headline on this landing page doesn’t match. The body copy of the ad highlights that you can graduate in as few as 18 months, but on the landing page it’s mentioned all the way near the bottom. Additionally, the image used in the ad isn’t close to any of the images used on the landing page. Having successfully completed Facebook ad campaigns for a different state university, I can say first-hand that headline and image match are very important when dealing with college-aged young adults who are bombarded with ads from different universities. When you purchase ads on Facebook you are spending real money, not monopoly money. This means you should be just as serious about getting a return on your investment as any other advertising channel. Dedicated landing pages will help you get there! Kristina is a marketing consultant for AdEspresso, a Facebook ad management and optimization software company.